Summon: Deal 2 damage to your opponent. Camlorn Hero is a common Intelligence creature card. It is part of the Core Set. "Honorless insects, they dare face me?" "By Akatosh, I will end you!" "Do not test me, knave!" This card was previously part of the training mechanic where it could be upgraded from Camlorn Adventurer at level 7. The card is named for the High Rock city of Camlorn. The quote "I used to be an adventurer, like you" is likely a reference to a famous line of guard dialogue from Skyrim: "I used to be an adventurer like you. 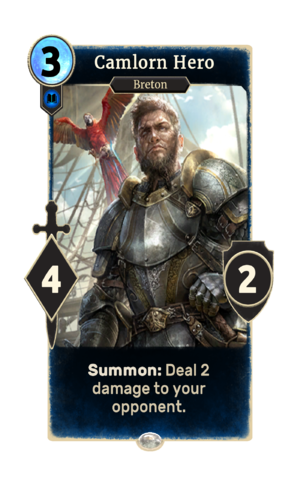 Then I took an arrow in the knee..." However, it also refers to the fact that the card is trained from 'Camlorn Adventurer'. This page was last modified on 14 February 2019, at 00:31.